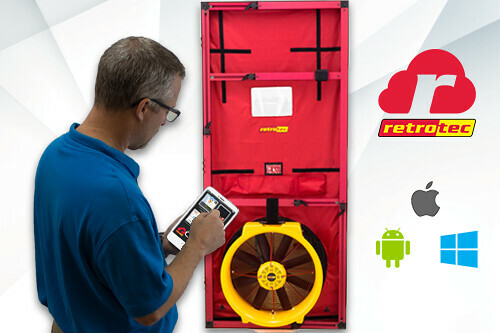 [SPONSORED CONTENT] Last year, Retrotec revolutionized the blower door and duct testing industries by releasing rCloud, the first testing platform of its kind. 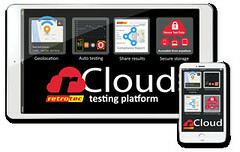 Retrotec’s rCloud app is a solution for the market’s need for accurate tests and reporting standards & techniques. rCloud enhances conventional testing techniques and updates old practices with automated and streamlined methods. The rCloud app provides secure and accurate data that includes the location of the test, local weather, set-up conditions, photos, and the calibration date of the gauge. In some markets, rCloud will provide existing housing data. rCloud then automatically performs blower door or duct tests to common standards, and creates secure compliance reports that can be shared immediately and viewed from anywhere. The rCloud app is already available (and free to download) for iOS, Android and Windows 8.1 & 10. Individual users can create a single user account, or companies are provided an option to create a business account and add in multiple users. Your test results can be reviewed in the app or online. View and sort all the tests in a list or view on an interactive map. Select any test location, view all the tests performed at that location, select an individual test, and share the compliance report. The rCloud app provides quality assurance for the tester and entire team. Data is collected securely, time & date-stamped, geo-tagged, and uploaded to cloud storage. Data storage is secured through Microsoft Azure, and the data is protected the moment the test is complete. Even while the data is stored in the device it is encrypted and cannot be altered. The rCloud app currently includes testing standards for International Energy Conservation Code 2009, 2012 and 2015, RESNET and California Title 24 standards. This includes duct testing and single and multipoint blower door tests. What’s Next for rCloud Users? New test types continue to be added, including a full release of the ANSI/RESNET/ICC 380 testing standard. A generic air leakage testing option is also underway, one not tied to a particular standard. This includes Single Point and Multi-Point options and the ability to enter CFM, ACH and CFM/ft2 values for a “Pass/Fail” result. rCloud will soon integrate with Retrotec’s Excalibur project, which will provide access to the fan flow equation parameters from the cloud, based on fan serial number so users do not have to enter them. When a fan is calibrated at Retrotec or a Retrotec affiliated lab, the fan flow equation parameters will be pushed to the cloud, eliminating the need for a tester to enter them into the app. rCloud testing reports will allow for more advanced customization, including the ability to add logos, notes, additional photos, and related information to individual tests performed. New rCloud platform features will allow testers to choose between using an app or a website portal to perform operations. In addition, future options will allow a tester to enter an rCloud “practice mode” for demonstration tests. Retrotec is also underway with providing users a way to perform duct testing to outdoors (using two gauges to perform a blower door and duct test simultaneously). rCloud advancements will soon be available to users outside of the North America. Retrotec is adding the ability to choose from multiple languages, to specify different units of measurements, and European standards for duct testing. Major International testing standards are in development, including the ATTMA (Air Tightness Testing & Measurement Association) testing standard, as well as completion of ISO 9972:2015 standard. Retrotec plans to customize the ISO:9972 tests to check compliance with country-specific variants of the standard. It’s no secret that Retrotec’s blower doors and duct testers are designed for “ease of use.” rCloud is no different. While Retrotec plans on continued development, new rCloud features are focused around broader audiences and simple operation. Those new to rCloud can download the app on iOS, Android, or Windows to begin testing. Retrotec will continue to roll out updates to the app without affecting current users. Those interested in staying involved with new release dates and product developments, subscribe to Retrotec’s newsletter or visit Retrotec.com/rCloud. Discuss this article with other home performance professionals at Home Energy Pros!.